Yerba santa or holy herb was regarded as a panacea by the indigenous peoples of American living in the dry, rocky, mountainous regions of what are now the western United States, notably California and Northern Mexico where it grows. The Spanish settlers who observed the natives’ respect and use of this plant gave it the name holy herb. 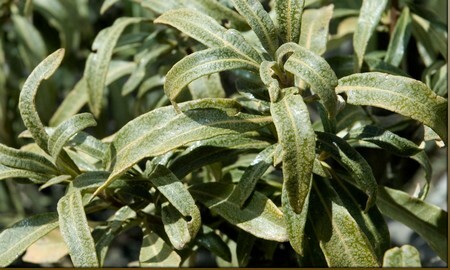 Yerba santa is an aromatic evergreen shrub, with woolly leaves which exude a glutinous resin. The funnel-shaped clusters of lavender-to-white flowers are loved by bees; the honey produced from nectar from yerba santa has a slightly spicy flavour, because of the pungent taste of the plant. The native Americans boiled the fresh or dried leaves of yerba santa to make medicines to treat colds, coughs, catarrh, sore throats, stomach aches, vomiting and diarrhoea. They chewed or smoked the leaves for asthma and applied them externally for rheumatism, aching limbs, sores and swellings. Settlers in the 19th century considered it a good blood purifier and used it for rheumatism, tuberculosis and fevers. The leaves of yerba santa have a warming, pungent taste and make a good drying remedy for clearing chronic phlegm, for colds, hay fever and sinusitis. They act as a stimulating expectorant for shifting phlegm from the chest in coughs, bronchitis, asthma and a variety of chest infections. The relaxing effect of this plant helps to reduce spasm in the bronchi associated with asthma and wheezing during chest infections. It is also helpful in croup, laryngitis and harsh, irritating coughs. The bitter taste of the leaves stimulates the flow of saliva in the mouth and of digestive juices, enhancing appetite, digestion and absorption, and helping to resolve digestive problems. Yerba santa acts as a urinary antiseptic because of the presence of phenols, resin and essential oils, and so it makes a useful remedy for bladder and kidney infections. As a diuretic it aids elimination of toxins from the body via the urinary system, and so acts to cleanse the system. For this reason it is considered good for rheumatism and arthritis. Its stimulating effect upon the circulation brings out sweating and so it can be used to treat fevers. 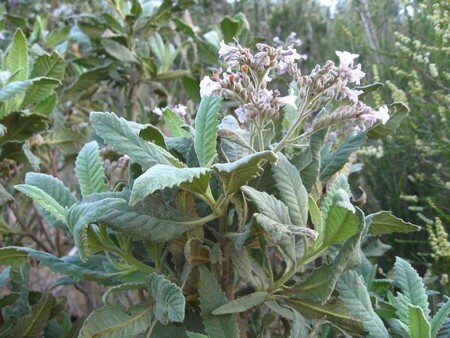 Externally, yerba santa makes a useful antiseptic for cuts, wounds and insect bites. It has been used to soothe rashes such as those caused by poison oak or poison ivy and to reduce swelling and inflamma­tion in bruises and sprains. It can be applied to heal haemorrhoids and used as gargle and mouthwash for mouth and throat infections. Eriodyction is prepared from the whole plant of yerba santa, and like the herbal remedy, has a partic­ular affinity for problems in the chest. It is prescribed for asthma with copious mucus, bronchitis and TB with night sweats. It is also used for the symptoms of hay fever and cold, such as sneezing and runny nose, fevers, sore throat and sharp pain in the right lung. It can be given for nausea which is aggravated by running and changing positions. Yerba santa is used for unresolved grief and sadness buried in the heart and causing depression and a melancholy that pervades life. Breathing problems such as in asthma, TB or pneumonia may be caused by congestion in the chest, and aggravated by a need to smoke. Yerba santa promotes the release of unre­solved emotions and restores life and joy to the heart, enabling the free flow of natural feelings again and the ability to breath without constriction.